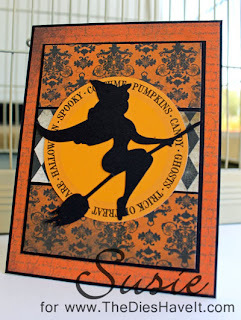 Just in case you are thinking about getting your Halloween cards or invitations done early, I thought I'd show you a super quick and easy one. I saw the sketch below from the Sweet Stop and knew right away what I wanted to make. I selected papers from the new Authentique line and then chose two Silhouette files. The orange circle is a cut and print file and the witch is just a cut file. I am madly in love with my Cameo. Can you tell? 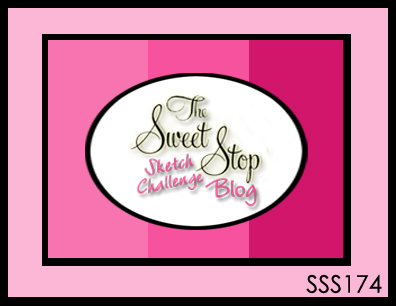 Now, if you want to play along with the Sweet Stop's challenge this week, just take a look at the sketch below and make your card. Then click here to upload your card and join in the fun. I hope you will play along this week. Now tomorrow I'll be back with Freebie Friday from Bugaboo Digi Stamps. I know you can hardly wait! Very pretty Susie. 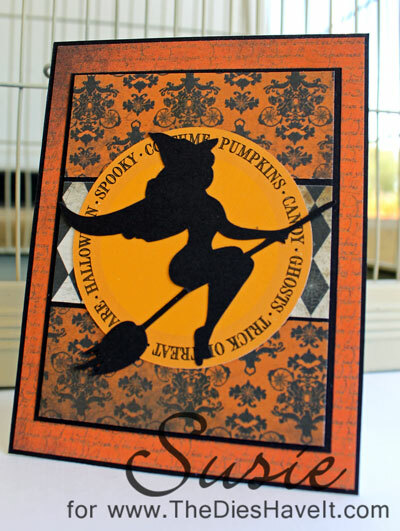 Love the elelgant silhouette witch image in the orange circle. The papers are so pretty. Thank you for playing along with us at The Sweet Stop this week. I like it so much THANK YOU for playing along in the Sweet Stop Sketch! Please join us again this coming week! Have a great day! This such a cute card. Just adorable. You did a great job. Hey i am having a giving on my page. you should check it out.